Interested in cooking fresh geoducks at home, but not sure quite how to prepare the giant clams? Here’s our video guide to the whole process. We’ve included text instructions below for easy reference. 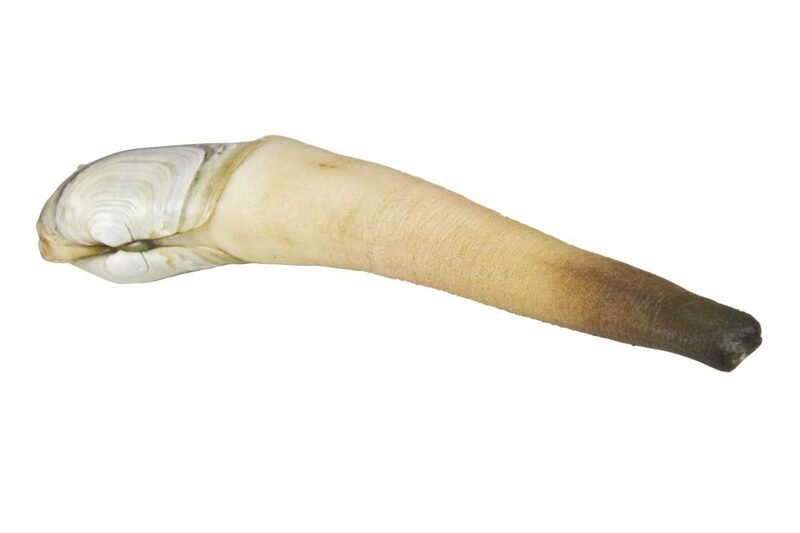 Test your geoducks to make sure they’re still alive (how to test geoducks for freshness). Bring a stock pot of water just to a boil on the stove. Blanch the geoduck for 6-8 seconds. Remove from the water & let the duck cool until you can handle it. Use a paring knife to cut around the shell, releasing the body. Remove & discard the geoduck’s internal organs. Starting on the body end, pull the skin off of the siphon/neck. It should come off in one piece like a sock. Return the geoduck to the hot water for just a second to rinse out the cavity. Cut down the middle of the siphon to either halve it or butterfly it (either works), exposing the center of the siphon. Wash out the sand and grit from the center of the siphon. Use the geoduck meat in whatever manner your recipes call for. The firmer, chewier siphon/neck meat is often thinly sliced and served raw as sashimi. The softer mantle/body meat is often fried, grilled, sautéed or used in soup.